President Obama and President-elect Donald Trump met at the White House Thursday, with Obama calling the 90-minute meeting "excellent." Trump said he looked forward to receiving the outgoing president's "counsel." 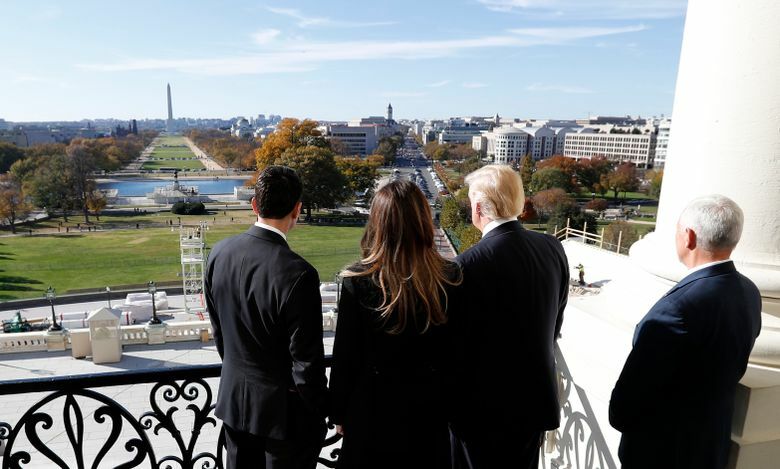 WASHINGTON (AP) — President-elect Donald Trump took a triumphant tour of the nation’s capital Thursday, holding a cordial White House meeting with President Barack Obama, sketching out priorities with Republican congressional leaders and taking in the majestic view from where he’ll be sworn in to office. “I very much look forward to dealing with the president in the future, including his counsel,” Trump said from the Oval Office. He’ll begin occupying the office on Jan. 20. 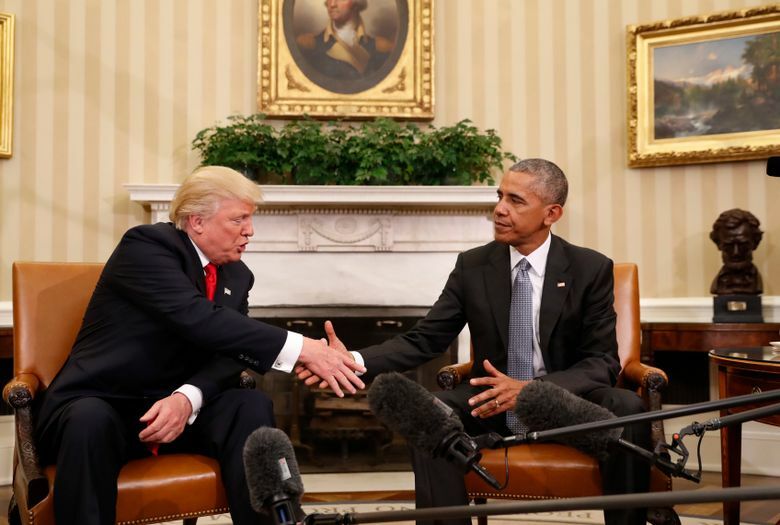 While Trump noted that he and Obama had never met before, their political histories will forever be linked. Trump spent years perpetrating the lie that Obama was born outside the United States. The president campaigned aggressively against Trump during the 2016 campaign, warning that his election would put the republic at risk. But at least publicly, the two men appeared to put aside their animosity. 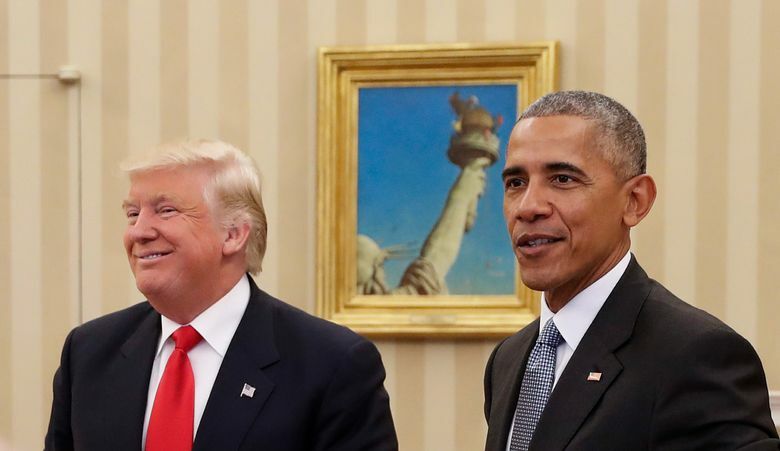 As the meeting concluded and journalists scrambled out of the Oval Office, Obama smiled at his successor and explained the unfolding scene. “We now are going to want to do everything we can to help you succeed because if you succeed the country succeeds,” Obama said. 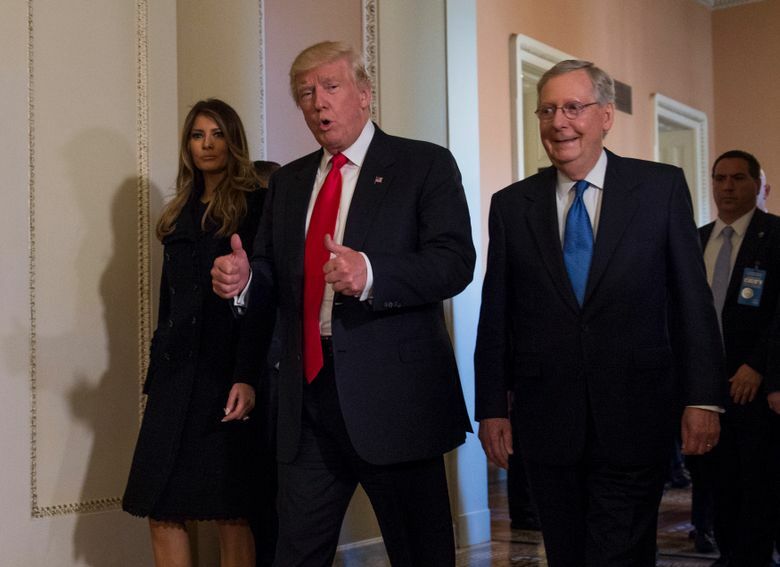 From the White House, Trump headed to Capitol Hill for meetings with House Speaker Paul Ryan of Wisconsin and Senate Majority Leader Mitch McConnell of Kentucky to discuss the GOP legislative agenda. Ryan, who holds the most powerful post in Congress, was a sometime critic of Trump and never campaigned with the nominee. Emerging from the meetings, Trump sketched out priorities for his presidency. Trump was also beginning the process of putting together his White House team. Republican National Committee Chairman Reince Priebus, who worked his way into Trump’s inner circle during the election, and top campaign official Kellyanne Conway were emerging as possible picks for White House chief of staff, according to two people familiar with the transition planning. A third person said conservative media executive Steve Bannon was also in the mix, though others insisted Bannon would not have a White House role. Those involved in the process insisted on anonymity because they were not authorized to discuss the planning publicly. A decision on chief of staff is expected in the coming days. First lady Michelle Obama met privately in the White House residence with Trump’s wife, Melania, while Vice President Joe Biden saw Vice President-elect Mike Pence late Thursday. Trump’s team was said to be sketching a robust role for Pence, an experienced Washington hand, that would include both domestic and foreign policy responsibilities. Obama and Trump met alone, with no staff present, White House press secretary Josh Earnest told reporters following the discussion. Trump traveled to Washington from New York on his private jet, breaking with protocol by not bringing journalists in his motorcade or on his plane to document his historic visit to the White House. Trump was harshly critical of the media during his campaign and for a time banned news organizations whose coverage he disliked from his events. At the White House, Obama chief of staff Denis McDonough was seen walking along the South Lawn driveway with Jared Kushner, Trump’s son-in-law. A handful of Trump aides trailed them. More than 100 protesters held a sit-in outside Trump International Hotel just blocks from the White House. 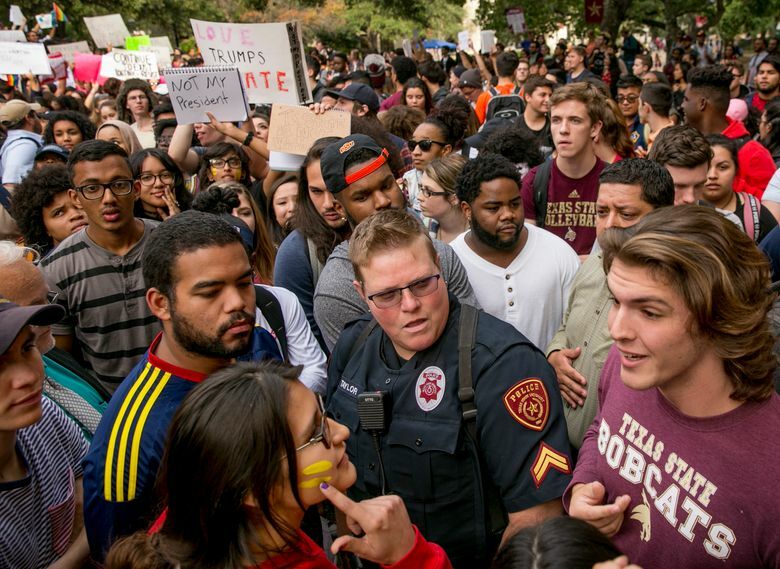 The mostly student protesters held signs saying “Love Trumps Hate,” a phrase Democrat Hillary Clinton often used during the campaign. Trump’s advisers, many of whom were stunned by his unexpected victory, plunged into the huge task of staffing government agencies. A transition website, GreatAgain.gov, referenced 4,000 political appointee openings. Officials at the Pentagon and State Department said they had not yet been contacted. As president-elect, Trump is entitled to the same daily intelligence briefing as Obama — including information on U.S. covert operations, information gleaned about world leaders and other data gathered by America’s 17 intelligence agencies. The White House said it would organize two exercises involving multiple agencies to help Trump’s team learn how to respond to major domestic incidents. AP writers Erica Werner, Andrew Taylor, Julie Bykowicz, Steve Peoples, Matthew Lee and Robert Burns in Washington, and Jonathan Lemire in New York contributed to this report.